Once relatively unnoticed, the precision screen printing industry is forging a successful path into the growing global solar energy market. Taiwan’s Brave C&H Supply Co. Ltd., a major supplier of screens, printing equipment, and related consumables, has been leading the R&D efforts in applying polyimide (PI) materials to the field of screen printing technology. Since its establishment, Brave C&H has been delivering game-changing innovations that upended the traditions of the precision screen printing industry. At this year’s SNEC PV Power Expo in Shanghai, Brave C&H again attracted international attention with the official release of its latest solution for PV cells – the F9900 series of PI screens. By clearly demonstrating the advantages of PI, the F9900 series gained high recognition from domestic and international participants of the event. Possessing excellent properties, polyimides have been used in many industries, including optoelectronics, semiconductors, and aviation. Brave C&H is among the pioneers that applied PI materials in the area of precision screen printing and has obtained key related patents in Taiwan and China. The printing screens for the fabrication of PV cells have two features that are vital to raising the cell’s conversion efficiency and lowering its cost. The first is the durability of the material that makes up the screens, and the second is the ability of the screens to produce metal lines that extremely thin in width. Polyimides are generally known for their high resistance to physical forces, extreme temperatures, and various chemical solvents. Combined with laser processing, screens composed of PI materials can completely overcome the deficiency of not being able to produce extremely fine lines with the traditional emulsion. Brave C&H has successfully developed and released numerous screen products of this series. 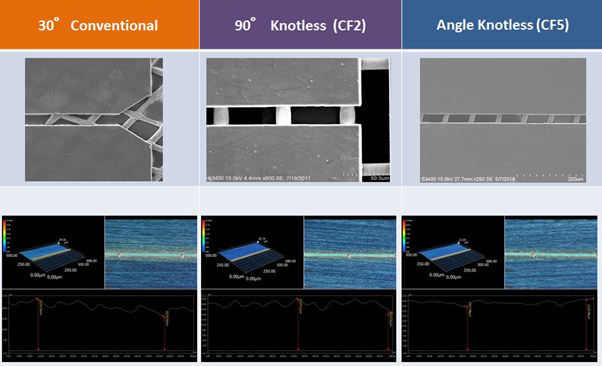 The company’s main offerings for PV cell fabrication include SF1 (conventional angled screens), CF1 and CF2 (90° knotless), plus KA (knotless angled) products. 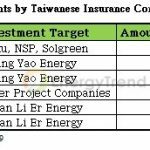 These solutions have been widely adopted by solar companies in China and worldwide. Recalling on why Brave C&H began to incorporate PI materials to the development of printing screens, the company’s general manager Chen Kan-Fu said that the decision was driven by necessity. As a long-established screen supplier, Brave C&H once held a global market share of more than 60%. However, the competition in the precision screen printing market has ratcheted up with the influx of entrants that undercut each other with cheap products of inconsistent quality. Rather than following the same strategy as its large-scale competitors, Brave C&H has opted to pursue innovations. Over the past four years, the company has spent massive amounts of capital to recruit top industry talents and develop cutting-edge equipment technologies. By turning past failures into valuable experiences, Brave C&H eventually created successful products that have remained up to the present as the most advanced and unique in the market. With highly durable screens that allow for the thinnest lines, Brave C&H does not need to slash prices as its competitors do to attract clients in the solar industry because its solutions meet the need to lower production cost while raising conversion efficiency. Chen Kan-Fu pointed out that PI solves a problem that often occurs during screen printing with photo emulsion. This problem also involves the limitations of the additives in the compositions of the conductive metal pastes (e.g. silver paste). In the past, materials based on polyvinyl alcohol (PVA) were used to make the emulsion structure that looks like interlocking fingers. However, the printing process can easily break the “small fingers”. Furthermore, PVA materials can swell up when they absorb chemical solvents. In addition, clients in the solar industry are now demanding thinner conductive metal lines on PV cells. In the past, high swelling coefficients were tolerated because the width requirements of conductive metal lines were not particularly stringent. As solar technologies advance, however, the demanded width of conductive metal lines (also called “fingers”) becomes narrower – from 30μm to 25μm, 20μm, and even 15μm. Just for comparison, a strand of human hair is about 60μm thick. If PVA materials structurally expand during the printing process, the results will be negatively impacted. Screens in the F9900 series are made of a PI material that is totally resistant to chemical solvents. This PI material does not absorb solvents, nor does it become swollen and soft when it is soaked in a solvent. 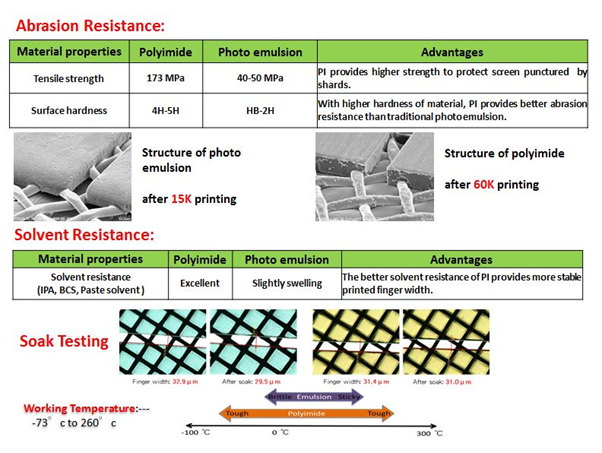 Having a very low swelling coefficient, the PI material is able to maintain its structural integrity during processing. Furthermore, conductive paste suppliers have more options in product development with PI-based screens. They can add or change the ingredients of their pastes to ensure a smoother printing process (e.g. more effortless paste application and less paste residues stuck on the mesh). The F9900 series includes conventional angled screens (SF1), knotless screens (CF2), and KA screens (CF5). Many participants of this year’s SNEC PV Power Expo in Shanghai were very impressed by Brave C&H’s product exhibition. “Conductive paste manufacturers did not pay too much attention to our field in the past,” said Chen. “However, they are now very interested in what we do because they have discovered that our products can significantly improve the printing process.” Since the conclusion of SNEC, Brave C&H has received proposals from many solar companies for technological collaboration in the future. Chen believes that his company will be able to reach its targets in expanding market share and product adoption for 2018. 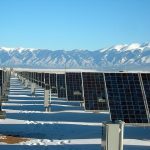 The global solar market has been rocked by the radical policy changes introduced by the Chinese government at the end of this May. Regarding China’s new solar policies, Chen stated that local solar companies would probably be the most affected party. Foreign solar companies, on the other hand, are now taking a “wait and see” approach and focusing on reducing excess inventory. Chen does not believe that China’s new policies will knock out the industry and cause the market to contract in the long run. Chen’s emphasis on the positive developments indicates that Brave C&H is confident in the future growth of the global solar market and will strive to offer leading-edge solutions for precision screen printing on PV cells.